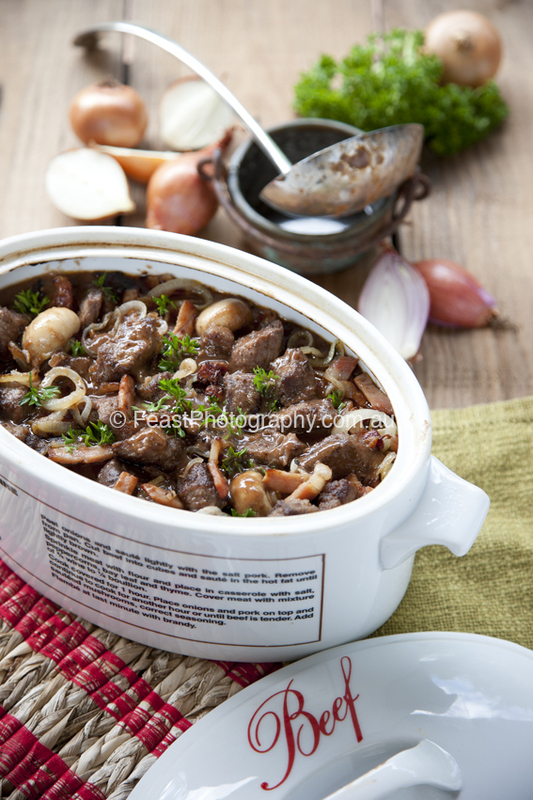 Beef Burgundy is one of the French classic casseroles; it is the beef equivalent of Coq au Vin. You will notice that neither dish contains the tomatoes that are so characteristic of the dishes of the Mediterranean coast. Use rump steak for this for best results. Cut the beef into 3cm cubes and the kaiserfleisch or bacon into bite size pieces. Heat oil in a heavy based frypan and heat a little of the olive oil until very hot. Sauté the kaiserfleisch or bacon until crisp, remove it to a plate and set aside. The bacon is not added to the casserole until near the end of cooking. Add the meat in small batches to the oil and bacon fat in the frying pan and seal the meat on all sides until well browned. The colour achieved now will affect the final outcome of the casserole. When all the meat has been sealed, return it all to the pan and add the flour, mixing well with the meat to incorporate. Gently heat the brandy in a small saucepan and making sure the exhaust fan is turned off, set the brandy alight. Pour the brandy over the meat and toss it through until the flame subsides. Place the meat in a heavy casserole. Pour the stock into the pan with the red wine and de-glaze the frying pan, scraping any bits from the sides and bottom and stirring them well into the liquid. Add to casserole. Heat a little more oil and gently sauté the garlic and shallots until tender. Some recipes add them to the casserole raw, but I prefer to cook them. Add to casserole, then add the tomato paste, the bouquet garni and season to taste. Make sure there is enough liquid in the casserole to cover the meat. If not, add more water or stock. Cover the casserole and place it in a preheated oven at 220C for 10 minutes, or as long as it takes for the mixture to come to the boil, then reduce temperature to 150 – 180C and allow to cook for about 1½ hours. Remove from oven and allow to cool. Refrigerate overnight. Next day, remove all fat from the surface of the casserole. Gently re-heat casserole on top of stove and add the bacon. While casserole is re-heating, sauté the peeled whole pickling onions in the half the butter until they are beginning to colour and all are well glazed. Add to casserole. Trim the mushrooms and cut any that are too big in half, otherwise leave whole. Add the remainder of the butter to the pan and sauté the mushrooms for just a minute. Add the mushrooms only 10 minutes before serving time. Check the seasonings and serve garnished with chopped parsley. You will note that I cook half this dish in the oven and finish it on top of the stove. I still believe that the French slow-simmered dishes are better cooked with heat surrounding them than sitting directly on the heat where the bottom is likely to catch and spoil the flavour.